It’s been a wee while since we last blogged so lots to catch you up on……………………. We left Ohau B and headed for Tekapo to spend a few days R & R; just walking the dogs, reading, watching movies etc. Walked into Tekapo for breakfast at a cafe with Mac-Rose in-tow and enjoyed the views. The day we left we headed up to Mt John Observatory to view the scenery and boy was it worth the $8.00 to use the private road. The only down-side was the narrowness and twisting turns of the road. We were blown away by the panoramic views showing the starkness of the McKenzie Basin with the majestic Alps as a backdrop. Our return trip down the mountain was nail-biting as campervans raced up towards us only slowing down as they almost grazed our mirrors………bloody tourists lol. It was nerve-wracking but we managed to reach safety without mishap!! 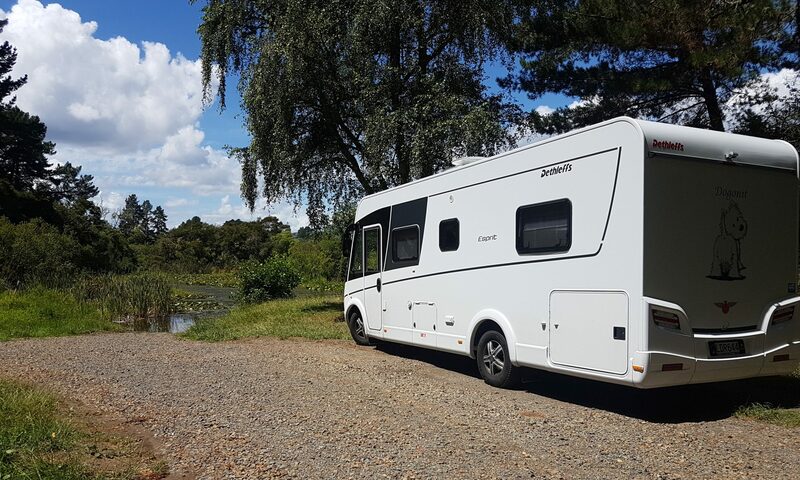 On we travelled to Fairlie where our destination for the night was the Musterer’s High Country Camp where we were greeted by Eunice who showed us our berth for the night and I was able to do some laundry. This camp is lovely; it has individual units each with their own hot-tubs and has beautifully maintained lawns/gardens. There is also a menagerie of donkeys/ llamas/sheep and a lone goat. Mac-Rose were able to meet the animals but Mac was a little wary of them. We moved on via Timaru and headed for a freedom camping spot called Patiti Point. The location was hard to find but well worth the effort with magnificent sea views and a walking path for the dogs for the morning. We liked Timaru; a lovely town and the freedom camping was well set-up although we did have a ‘slider’ next door………………. Onwards and we headed for another POP called Peski which was a small camp area with power. It has a small number of permanent campers and is registered for NZMCA members with a small charge for a powered site. We were visited by the owner’s old dog Tui who welcomed Mac-Rose and spent some time with us. The following morning we headed towards Oxford intending to use another POP location; an old historic pub. We emailed the owner but did not receive a response until we arrived to find the pub closed. There was no indication why it was closed so we moved on. We found another POP close by and headed towards it; again having unsuccessfully attempted contact. We received an email from the Pub owner who advised we would be very welcome and apologising for not responding sooner but the Pub doesn’t open until 4 pm…….weird huh? The POP on the NZMCA App showed dogs were welcomed so we thought we would head there anyway. We arrived to find a huge sign on the drive stating NO DOGS; disappointed by the discrepancy we again moved on and changed our focus to the NZMCA park at Weedon – on the outskirts of Christchurch; this was inadvertently one of the longest drives we have undertaken in one day. We had a lovely lunch the next day at the Riccarton racecourse after a visit to the leash-free dog park where Mac-Rose had a proper bath and then went to a carwash for Dogonit to have a bath too. We left Weedon the following day and headed to Rangiora for a laundry and grocery stop and then headed for sanctuary at Heather’s place outside Kaiapoi where we started the South Island journey together. Heather made us really welcome by allowing us to use one of her empty paddocks so that Mac-Rose could run around much to their heart’s content!! Heather has a lifestyle block and is in the middle of lambing so I had the pleasure of helping her feed three orphaned lambs – I haven’t done this since Rod’s mum and dad had their farm in Otewa back in the 80’s……..bliss!! While we were there news came in that there was to be a snow-dump south of the Waimakarere River so my lovely husband offered to drive me back to Tekapo so I could engage my alter-ego – The Snow Queen. We left Heather’s round 9 a.m. and drove the 3+ hours back to Tekapo after checking the Met Service for changes; they confirmed snow so we were feeling excited. We waited; and waited; and waited but the weather showed no signs of turning to ice, snow etc. Rod checked the Met Service and it appeared Tekapo might miss out…………….lips pouted and the Snow Queen internally wept!! We went to bed to the sound of rain after discussing what we would do in the morning………….. imagine my excitement when; in the middle of the night Rod wakes me and said “look out the window”. He turned the outside light on and there they were……….tiny drops of icicles falling from the sky. This increased over time and by morning we had snow on the ground – not a huge amount granted; but snow on the ground……..enough for me to do my snow angel impression. Mac-Rose looked outside as the door was opened and spent some time almost in wonder. They then headed outside and were rollicking in the snow almost immediately. They ran, skipped over the snow and then started digging………doggy heaven!! I threw a couple of snowballs at them as they played and even threw one at Rod; missed lol……………loving it!!! What a great time we had at Ohau B Canal. On-route we stopped for the weekly laundry trip in Twizel before coming to rest alongside the canal with several other RV’s/caravans. Within minutes of arriving we met the couple in the RV in front when they opened up their rear window so their dog could welcome us. Mulligan is a 4 year old Labradoodle with a serious heart condition reasonably recently diagnosed. He was obviously excited to meet Mac and Rose and we chatted long enough with his ‘mum and dad’ to realise we would get on well. The morning after our arrival we headed off to the High Country Salmon farm across the canal to have a mediocre breakfast and ‘borrow’ some salmon pellets while we were feeding them as we had been advised by a gentlemen that the pellets were great as fish bait. As we were leaving Mulligan and his ‘mum and dad’ were pulling in. We got to chatting and re-introduced ourselves………..Steve, Janine and Mulligan were only intending to leave to head to Wanaka as they wanted to watch the Bledisloe test match. We commented that we were going to watch as well (thanks to our very special friend – you know who you are) so plans were made to have dinner together and watch the game. Rod attempted fishing that afternoon with a fly road but the pellets were too hard to put on a line and cracked under pressure so he went back to trout fishing instead. Dinner that evening was a simple chilly followed by a very mediocre bread and butter pudding (I blame it on a combination of afternoon drinks in the sun, too small a dish and forgetting the sugar lol). The game was great but what increased the excitement was discovering that we were in the presence of ‘family rugny royalty’…….Steve and Janine are the parents of ex-All Black Mark Cooksley. We had such a great evening…………..I think this is one of the wonderful aspects of RVing – meeting really great people!!!! The next morning was a relaxing start – a little bit of house-work etc. Mulligan and Mac enjoyed some ball play while Rose schmoozed other ‘guests’ . The ball went into the water a couple of times and Mulligan came to the rescue by fetching it back for Mac. As a result he had to have a shower while Mac and Rose kept their distance as they were not keen on participating in this game. The rest of the day felt empty when the Cooksley’s moved on but we had txted a little later in the day once they were camped up at Lake Benmore making a fruit loaf. The following day we were woken to light snow flurries which excited the Snow Queen although her excitement was temporary. Rod, Mac and Rose enjoyed the brisk temperature while out on their walk with Mac and Rose rolling gleefully in the frost and snow. We left Ohau B Canal and headed towards old territory – Lake Tekapo. With cold weather expected and snow down to 700 mtrs we are hoping we will be able to meet the Ice Queens expectations of creating an ice angel……..here’s hoping!! We spent an extra night at Ranfurly and the following morning we were invited over to the “White House’ for coffee and home-made pikelets (my contribution). We were in awe of the motor home, the lounge was enormous; and the kitchen was not much smaller. They also had a large bedroom; but that is the advantage of ‘pop-outs’ I guess. Sue and Gavin left later that morning and we were alone again ………until a smaller vehicle joined us but they kept to themselves. We decided to head to the local pub that evening; for a drink before having a take-out. We arrived at the pub and sat at a bar table big enough for a crowd (only space left) and were joined by a local family who made our evening and were really welcoming. We left after a couple of drinks and ordered our take-out before heading for ‘home’. It was a relaxing evening watching a TV series we had downloaded and bed. We left Ranfurly the following morning via Middlemarch – where the single farmers meet the eager ladies for a dance and whatever else lol. We safely ventured through ‘Orc country’ with Mac and Rose on guard the whole time……..keeping us safe. We headed towards Mosgiel where we would be staying at the Mosgiel A & P grounds for the night. We were lucky to have a powered site for $15 and that also included toilets, showers & a laundry. I had PLENTY of washing to do and although washing was not a problem the drier was another issue altogether…………..however eventually I dried most of it before we met up with Jim and Sue. Jim served in Waiouru at HMNZS Irirangi and on HMNZS Waikato with Rodney and the and our last catch-up was in 1978 so it has been a long time between memories. Jim brought us some lovely fresh Blue Cod fillet for breakfast …..thanks Jim; yum!! We laughed and shared old and new memories and then headed to a restaurant for a meal before they dropped us off at Dogonit for the night. The following morning we had a slow start to the day not leaving until late morning and heading for Dunedin to stay at the NZMCA park. Our arrival in Dunedin sparked a myriad of memories for me (2004) as I spied old haunts – the motel, hospital etc. ; on-route to our destination. It feels surreal to be here again. The following morning we spent part of the day shopping and preparing dog food and then relaxed for the rest of the day until Alana (our God-daughter) joined us and we took Abe, Mac and Rose for a walk through the park. That evening, at Alana’s invitation we went to an amazing restaurant for dinner and thoroughly enjoyed our catch-up. It has been years since we last saw her but it felt like it was only yesterday……many thanks Alana. Next day we left Dunedin and headed to Moeraki Boulders to check it they were still there. It is a unique sight………the boulders so spherical having been there for millions for years ground by the sea. Rod thought the café/gift shop were sneaky because there are two entrances – one; a DOC site has free access. The other has a very large sign pointing to the car park and as you arrive you have to pay $2 for access to the boulders when it would have been free 100 meters in the other direction. Anyway we paid our $2 and viewed the boulders before heading off. We reviewed options and headed for Butchers Gully located between Roxburgh and Alexandra but found the location although beautiful was not suitable for Dogonit so again moved on. Heading towards Cromwell stopping at Clyde for lunch overlooking the dam on-route. Over lunch we discussed our options for the night and using NZMCA App (thank goodness for the App) decided on Champagne Gully (rude not to stay really) as our destination. The vista was absolutely beautiful and the only negatives were: no bubbles to drink (I mean really; who wouldn’t want to drink bubbles in Champagne Gully)?………and the rude, noisy neighbours who arrived in the early hours of the night. We often have neighbours at the freedom parks and it is not a problem but we are becoming less tolerant of those who have vans with sliding doors and people who think the early hours of the morning are suitable to arrive and make lots of noise…………. The following morning after a crap night’s sleep we headed towards Arrowtown so Donna could do some gold-panning. We arrived and found it difficult to find suitable parking but eventually headed towards the place that arranges the gold pans etc. It was closed (sad face) so we visited the Chinese gold-mining settlement. This was very interesting and gave a unique perspective on what it was like for the immigrant Chinese – particularly those who came straight from the Australian gold mines. Arrowtown was full of tourists so we decided to move on heading back along the trail back towards Alexandra. We intended to stop at a place between Arrowtown and Alexandra to go gold-mining but by this time Donna was tired and decided to flag it until another day (a bit like the lack of oysters in Bluff that I have yet to eat – it will happen; but not today). Our destination for the night was the Grey Ridge Vineyards just outside of Alexandra. We arrived despite ‘Mrs Garmin’ giving us alternate directions and were greeted by Sue and her husband who own the vineyard. We nestled ourselves between the dam and the vines and settled Mac & Rose in before heading over to taste the Pinot Noirs (white, Rose and red varieties) which were smooth and fruity and it would have been rude not to purchase some!! Home again (and time for dinner and an early night) No sleep interruptions as the location was blissfully peaceful until well after 7:30 when we heard the workers arriving for their day’s labour. We have decided to spend another night here just for the pure hell of it…………….. Following our 24 hour interlude at Paptowai we headed for Purakaunui where we intended to spend the night after almost off-roading up a steep hill. We arrived at the DOC camp however the ground was really soft following rain and there were no areas to safely park. The beach was seal-free and the wind was up so we stayed for a short while after giving Mac and Rose a run on the beach and discussed our next destination; a POP in Owaka with the intention of heading to another POP the following night at Nugget Burn. We arrived at the farm of Gordon and Coralie who were our hosts for the night. We met their two boys who fell in love with Mac & Rose and they showed us a place where we could safely walk them. The night was relaxing and we were given some fresh eggs by Gordon – yummy!! Mac and Rose met the two hand-raised sheep and although they got up close and personal; there were trust issues (mainly on Mac’s behalf who has never forgotten the potential adoption by a sheep at Steve and Anne-Maries). A relaxing morning later we headed for Nugget Point to walk to the lighthouse but the weather is again inclement – wind was up; view is non-existant due to low cloud and rain so we shelved the to stay at Nugget Burn (POP) and headed for Balclutha to stay at a motor camp and do laundry etc. We have spent the day relaxing and intend to head to Subway for dinner (trying to be healthier). We have exciting plans as we head into gold-rush territory…………….watch this space! Here we are at the southernmost tip of the South Island in Bluff. We made contact with our new travel friends Warren and Toni whom we met at Lake Te Anau and they had arranged two options for our stay in Bluff – one was at the back of the RSA; the other in a secure yard owned by them. When we arrived we met them at the RSA and checked out both locations; choosing the secure yard so that we had privacy. Not only did Warren and Toni offer us the use of their yard but also took us sight-seeing (who knew that Bluff could be so interesting?) they also offered us the use of a vehicle for the duration of our stay. We were pretty blown away by their generosity……..even humbled by it. After giving Mac a bath at their place following time at a leash-free dog park in Invercargill (covered in mud; the princess was immaculate in comparison) we had coffee and then we returned to Dogonit to freshen up before they picked us up and took us to the RSA for drinks. Boy…… talk about Southern hospitality!! The crowd at the RSA were great, we laughed, joked and enjoyed a cold beverage until it was time to go to the Eagle Hotel for a wonderful dinner that included oysters and paua which was followed by a guilt-free dessert (nah; just kidding lol) and liquers. It was then back to Dogonit and quite late (for old folk) before we prepared for bed. Imagine how we felt when we pulled the covers back and discovered our bedding was saturated. One of our vents was open slightly and allowed the wind to blow rain inside. We had to strip the bed and remake it; the only saving grace was the waterproof mattress cover or we would have been more in the pooh. Thank goodness Warren had left the keys to his sheds in the car so we had somewhere to hang bedding to dry!! We met them the following morning and headed out on a dog walk – four humans and the White Dog Gang. The weather had cleared so we could see Dog Island and Steward Island in the distance. It was a little cool but well worth the walk despite us all feeling a little seedy from the previous night. We followed the walk with a lovely lunch of cheese puffs (one of my favourites!! And spent a couple of hours chatting before we headed home to Dogonit to have a rest before Chef Rod prepares a dessert to match the lovely roast that Toni is cooking for our dinner. Dinner was of course…..PERFECT!! It was lovely to share a meal with them and admire the beautiful view overlooking the harbour and Ti Wai Point. We ate till we were stuffed and then returned to Dogonit tot full to do anything but fall into bed. Today we did the ‘housework’ before Warren and Toni arrived – Warren to pick up his car so he could go off to work and Toni to chauffeur us around the sights of Bluff starting with Imauri Beach where I collected some rocks. The dogs Mac, Rose, Rastus and Jimmy had a ball playing together and honning up and down the beach. Our next stop was Bluff Hill to admire the 360 degree views; looking from Stewart Island to the bottom of the Alps….. it was just stunning; particularly because the day was clear and the sun was shining. There was also the remains of a Navy radar station. We headed for the bottom of the walking track where we could hear the Tuis and Warblers and watch the wood pigeons. There were also the remains of military posts erected at the end of WWI. By this time we could feel a poppy nap coming on; so after fortifying ourselves with food we are enjoying some R & R.
Tonight we are hosting Toni on board Dogonit for dinner as Warren will still be at work. Spent a second night at the NZMCA in Te Anau mainly due to the wonderful companions who arrived late on the first day and who also had two little white dogs (although not Westies); Warren and Toni are from Bluff and were taking their caravan for it’s maiden voyage. We got along well enough in the afternoon that we suggested happy hour at our place. They arrived with nibbles; enough said that dinner was late that night!! The next day Mac-Rose enjoyed an early morning walk and then we went shopping– sorting more tackle etc. for Rod’s trout line, and more groceries/wine etc. Rod gave the van a wash and we did some ‘housework’ stuff. Toni and Warren suggested another happy hour for that evening which lasted longer than the previous night but was also really enjoyable!! It is really great when we meet such lovely people and we have arranged to catch up when we visit Bluff. Had some excitement with another member (no, we were not involved). The next morning prior to departure we had coffee with our new friends and made our plans for Bluff where we will meet up. We enjoyed Te Anau and felt we should enjoy more of it’s scenic delights so decided to spend our ‘On-Power Night’ at the Lake View Camp just off the lake-side. The staff were friendly and we were quickly settled into our spot. I did the laundry and then we were taking Mac-Rose for a long stroll through the park. We enjoy the luxury of being on power as we can have long showers and in this instance the shower rooms were really modern and heated but the other of this coin is that there are more people coming and going. The next morning meandered south via Manapouri (Damn the Dam – for those in their late 50’s) and detoured to Lake Monowai. South heading for Tuatapere for the night but temporarily changed our minds and headed for Monkey Island (no real monkeys were involved in the naming of the island – it had something to do landing supplies in the early days). It was a great surf beach and Mac-Rose loved their time there but we were not really impressed with the freedom camping area; thought it was more suitable for smaller vehicles than Dogonit so we headed back to Tuatapere to Wairoa Town and Country for the night. We arrived and had a couple of drinks before heading back to Dogonit to watch TV and bed. The next morning we packed up and headed for Invercargill. I have to admit that the last time I travelled through here it was a weekend and the place was sooooo quiet but this time it was really lively. We went to the Caltex to fill up and couldn’t have had better service from a lovely young Irishman. I asked him how long he had been in New Zealand and he said 13 years; he met a Kiwi girl and they married and now have two children. We did some dog-meat shopping and then we headed to a dog park which was amazing; what a great resource for the locals!! We also went to Spotlight for me so I could finally finish the shawl I have been making while away. The knitting is complete but I am adding a fur edge to it. We left Invercargill and headed for Oreti River Bridge; a freedom parking area. It is beautiful and the locals are friendly (fantails and wood-pigeon) make for a lovely welcome. Rod has been out with his trout rod but he has tweaked his back so is taking it slowly…….the trout prove elusive at this stage but it is a whole new style of fishing to adapt to…….patience is a virtue as they say. Watch this space!! Tomorrow we intend to head off and make our way to Piano Flats following our usual WSS. Piano Flats is a DOC park and we are hoping that it is high enough that we may ‘see’ some snow!! More than likely there will be no cell-phone/internet coverage so we may be off-grid for several days. Fingers crossed as these intepid travellers face adversity looking for the perfect snow so Donna can make a snow angel lol. Until our next post ……………….be careful out there!! We left Hamilton Burn early in the morning (temperature overnight had dropped to under 0 degrees), while the earth was still frozen and had no difficulty extricating ourselves from the farm. We thanked Macka for his hospitality and gave him a donation for power/water use and headed towards Lake Mavora. We had emailed- Invercargill DOC and checked the conditions advising them of our capacity/abilities and asked about cell ph coverage/campground conditions/other considerations and received a response advising us to just use common sense and consider the conditions (not park in the mud etc). Lake Mavora is where they filmed the Fanghorn Forest scenes and when the fellowship split up. The road in is mainly metal but in great condition and the scenery is spectacular!!! We entered Fanghorn forest but did not spot any Ents, hobbits, elves or orcs so thought it safe to continue. We checked out several of the camping areas but wanted to ensure that our choice did not end in us having to walk out 20km to arrange a tow. We are close to the swing bridge (much to Rosie’s disgust) and near the boat ramp and there have been several cars with hikers or boaties so hopefully if we need help it may be close to hand. Our camp is set up in the location where the fellowship split up with Frodo and Sam sneaking off in a boat while the camp is under attack and again the scenery is full of LOTR atmosphere……..I can see why they chose the location. Great location to practice more fly fishing!! It is early evening and we are sitting down to a pre-dinner cocktail while temperatures outside keep plummeting………while the view is crystal clear. The day broke and the sun shone over Fanghorn Forest and we started the day with coffee and breakfast. We did our bit by cleaning the DOC toilet and Rodney went wood foraging with Mac-Rose who did their rabbit poo scavenging. Whilst in the forest Mac-Rose thought they sighted an orc but this is indeed unverified at this time. Rod then went trout fishing but the target species has at this time continued to elude him. We thought we would be experiencing solitude in the wilderness but there have been comings and goings of vehicles of all makes and models including two other campervans. We had a moment of concern when a vehicle pulled in behind us just after midnight – I was thinking of all the horror movies I have ever watched but they left soon after. In hindsight they were probably just looking for a camp site – not sure why they would be doing that at that late hour but……..
Decided to have a bonfire after our T-bone steak dinner…..the sun had been shining and Mac-Rose took the most of the opportunity to sun-bathe. The snow continues to elude me…..starting to take it personally now. The ice in the puddles is not longer solid and although it is cold we are well-prepared for it. Awoke to freezing cold this morning and an intermittent issue with one of our gas cylinders so made the decision to move on…………..Mr and Mrs Super Cautious!! We made our way to Te Anau to a WSS to discover that the freezing cold had caused our waste water pipe to burst…………….a simple repair once we find a plumber……Rodney lol!! We are currently parked up at the NZMCA park in Te Anau with a café nearby to fulfil our dietary needs although we are dining on pork belly on Dogonit this evening and may take the opportunity to eat at the café tomorrow night if we are still here. Our neighbours are a caravan (we are having happy hour with them late afternoon and a pack of alpacas or llamas (not sure which)………it is a lovely quiet location. We also met up with the Te Anau NZMCA custodian and when Rod mentioned he was taking a trip to Placemakers for some plumbing parts they generously offered him a ride. He has repaired the pipe which means we can dump our water as usual (yay!!). So as the sun sinks slowly over the yardarm we will say goodnight here in the depths of the South Island!! Well here we are on Hamilton Burn; a farm just over the border in Southland. This is a park over property so not available to the masses.
. As I explained to the young lady; when we get to our age and the instructions state that a toilet cassette can last last at least 3 days I advised that at our age we are lucky if it lasts 2-2 1/2 she provided the key to the backpackers so we could use it instead…………as I said; they went the extra mile for us!! We left this morning but had an issue with the RV – this time the satellite (all issues we have experienced have been related to the extra work undertaken since the vehicle landed in New Zealand…..go figure!!!). As the satellite was continuously alarming we contacted Apollo Entertainment and they gave some advice so Rod could disable it and we could continue our adventures. These Tuis are at the entrance to a private road….. Success disabling the satellite and off we went!! We headed to Queenstown (just like being in Auckland except for the scenery)……..we went to BP for a WSS. We had difficulty finding it due to the rubbish truck but eventually completed our septic needs and purchased a swap-a-bottle we then had to go the Caltex LPG refill (only 1 x swap-a-bottle) and then headed for the PackNSave. Mrs Garmin thought we would like to take the scenic route which was frustrating to say the least but at last we made it!! We stocked up and then headed to The Warehouse for extras and then we were on the road again. We had an issue when we were travelling along when a vehicle started using it’s hazard lights and brakes and had open their window open and were tapping the roof which had us concerned as Rod had been up there fixing the satellite earlier; so we pulled over. We were on a clear road with no vehicles behind us and had pulled over as much as were able with hazard lights on and had just spent a few minutes checking the roof when we saw a truck coming so we quickly started up the engine. It was at that moment that two vehicles pulled out to pass the truck, by this stage he had little space to pass so stamped down on his brakes which locked. We spent some time discussing the situation but felt that we had done everything we could do to safely pull over and then decided to leave the situation where it was……..in the past. We found our destination several kms later and were met by Macka who indicated where we were to drive to. I must point out that when I contacted him I asked how soggy the ground was where we would be parking and he said it was ok………….so imagine our surprise when we got stuck in the mud lol. Macka towed us to our spot and we will see whether we can extricate ourselves from our location tomorrow. We have been cautious and contacted our next potential location (a DOC camp) to ensure that the conditions are going to be ok for our vehicle so watch this space!!! Following our stressful day it was great that Rodney was able to repair our satellite dish and we are watching TV following a quick meal and for me a rum and black-current while Rod had a green ginger and rum. We may be off the grid if there us no cell phone coverage so till next time (if we don’t post in three to five days; worry lol)…….. So the intrepid quad are currently hunkered down on a canal near Twizel watching the rain in the comfort of Dogonit. We stayed at the Combined Services Club in Twizel……not much to say we paid $5.00 to stay out the back and almost got stuck in the mud at one stage. Found a reasonably stable patch of grass and headed in for a drink before dinner. No meals available (Fir, Sat, Sun only) but were offered some savouries while we enjoyed our beverage. Dinner that night was simple – fried rice and sausages and then relaxing until bedtime. The next morning was off to the laundromat…….expensive exercise in Twizel!! In my next life I will own several of these and live high on the hog lol!!! The laundry took most of the morning due to a young man who took ownership of all the driers but we eventually finished and headed off for Ohau Canal B. This area is off-limits except for Meridian staff but NZMCA has an agreement for members who can park alongside the canal……beautiful location!! We parked and took Mac and Rose out to check out their new premises; lots of interest in the birds fishing the canal. We are close to the High Country Salmon farm but sadly no salmon rod only trout rod in our possession. Rod got his trout rod out and once tackle set tried his hand at the art of fly fishing. He looked the part but unfortunately the bank is steep and difficult to cast when you are learning so he spent some time practicing casting without tackle. We were joined by another RV- Graham and Jan who were spending the night here. Poor Jan had taken a fall off her e-bike and fractured her humerus 4 weeks ago and they had spent the time recovering in Cromwell. It is one of the reasons why we walk as I can fall over quite comfortably closer to the ground lol. We spent time with them talking RV stuff and then headed back for dinner………chilli (YUM)!! Mac and Rose have been reluctant to go out for their ablutions this morning even with their raincoats on but they did come with Nanny for a walk to the bridge. As we crossed, it gave me an idea how big the salmon farm really is. When I stopped Mac and Rose went to the edge to look over and once they realised they were on a bridge they splayed their legs and looked at me like I had betrayed them. The weather is closing in and it was quite blustery last night – wind and rain but today although it has been raining the wind has dropped and the sun is shining but within a half hour the wind is back up…..took Mac and Rose for a walk and the wind was so strong I couldn’t even draw a breath lol. We are undecided whether to stay for another night as we know the weather is supposed to be crap over the weekend…………….watch this space. wade alexander on Ohau I love to B on the road again…..